Against the backdrop of fierce airstrikes earlier in the week, Palestinians in Gaza are out again today to participate in the Great Return March. 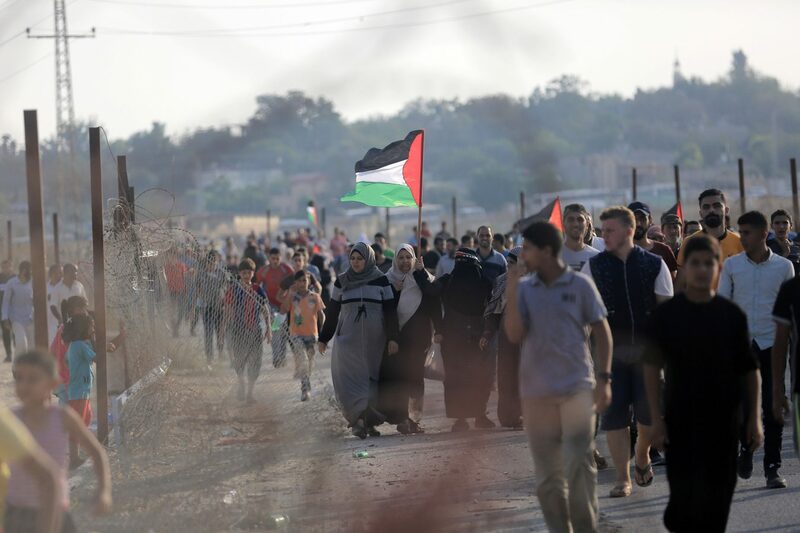 They gather in thousands at rallying points near the Israeli border fence as part of a mass demonstration to mark the one-year anniversary of weekly protests in the Gaza Strip. The march has continued to face a heavy crackdown from Israel, and the hospitals treating the wounded are stretched beyond words. But despite the traumatic repression, Palestinians go out in numbers each week, showing bold determination in the face of tactics designed specifically to stop the protests. That’s because these demonstrations are not just a reaction to current events, they are part of a liberation and self-determination movement that spans decades, and has gained new life through this Great Return March. On 30 March 1976, Palestinian citizens of Israel declared a general strike, and gathered in their villages, towns and cities to protest the state’s latest plan, which would take huge swaths of Palestinians’ land. The Palestinian citizens of Israel are those who managed to stay in their historic homeland after the Nakba in 1948. Thousands had been internally displaced and lost land and homes in the Nakba. 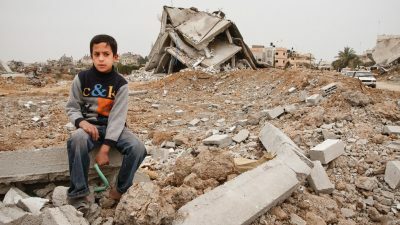 And even with nominal rights through citizenship, they were subjected to restrictions on movement, surveillance, arrest, and unequal distribution of resources – a set of apartheid policies that impacts the Palestinians inside Israel still today. Facing a new wave of land grabs, they had every right to raise their voices. But Israeli security forces opened fire on the unarmed protestors, killing six, injuring hundreds, and arresting hundreds more. From that day forward, Palestinians around the world have commemorated 30 March as Yom al Ard, or Land Day, vowing never to succumb to the pressure on them to forget their land and give up their struggle. Today, 43 years later, Palestinians have still not given up their demands. Last year on Land Day, Palestinians in the Gaza Strip gave new hope and power to this movement with the Great Return March. The Great Return March is a peaceful demonstration that thousands of Palestinians in Gaza have been taking part in every week for a year. 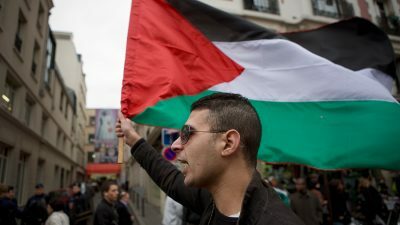 The march is a way for Palestinians to protest against the illegal blockade on Gaza, and to reaffirm their right and demand to return to the homes from which they were displaced in 1948. The demonstration is organised by a large coalition of civil society groups from across the political and social spectrum. 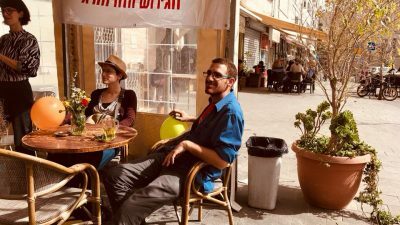 It includes music, dance, food, and storytelling, as well as some protests at Israel’s military fence (we tend to see images of only this part in the news). From the outset, Israeli security forces have cracked down with brutal force, opening fire on the unarmed protestors. 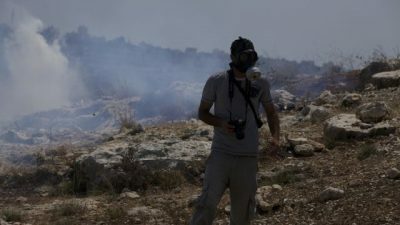 To date, over 200 Palestinians have been killed by Israeli forces in the weekly protests, including 52 children, and a number of medics and journalists, who were shot even though they were clearly identifiable as such. Over 29,000 have been injured, a staggering percentage of whom have life-altering injuries from being hit with live ammunition. The UK Government’s response to the Great Return March has reached new lows. Last May, the UN Human Rights Council voted for an independent Commission of Inquiry to investigate the use of force in Gaza. Shamefully the UK abstained on the vote, instead calling on Israel to conduct its own investigation. While 70 UK MPs from across parties called on the UK to suspend arms exports to Israel, the UK Government continued to approve arms sales, even as Israel continued to shoot unarmed protesters each week, and while it was being investigated for war crimes. And just a few weeks ago, the UK voted against resolutions in the Human Rights Council on the topics of illegal settlements, human rights, and Palestinian self-determination, and it abstained on the resolution to endorse the findings of the Commission of Inquiry. Let’s face it. The UK has a long history of disregard and disdain for Palestinian rights. After all, it was the UK that set the ground for the dispossession of Palestinians through the Balfour Declaration. But the fact that the UK has had a poor record before, does not make this descent any less disturbing. Two parallel lessons can be learned from the history of Land Day to the Great Return March:One has to do with what Palestinians call ‘the ongoing Nakba’, referring to the constant land grabs that Palestinians face due to Israel’s settler-colonial practices. Palestinian dispossession didn’t begin and end in 1948; it continues today, all over historic Palestine. Trump’s most recent announcement that he will recognise Israel’s annexation of the occupied Golan Heights gives Israel a further green light to continue its annexation elsewhere, dispossessing and displacing Palestinians and creating new refugees. It’s exactly these types of actions that prompted the Land Day protests in the first place. And it’s the refusal of (already dispossessed) Palestinians to give up their struggle that led to the Great Return March. And that’s the second lesson we can take. The Palestinian story is one of dispossession on the one hand, but it is also a story of beautiful and dignified struggle for freedom, justice, and equality. It’s a love story between a people and their land, and one more chapter in the longer legacy of anti-colonial movements from around the world. There is another set of characters in this story: the people of conscience around the world, including here in the UK, who stand in solidarity with land defenders, and who are moved to act for the sake of justice. The history of internationalism in this country is what will carry us forward in all of our interconnected struggles. As trade unionists, students, people of faith, and ordinary people taking a stand, we are lucky to play a key role in these beautiful struggles, and our role is clear. And the time to act is now. Palestinians have called for a global day of action today, on the anniversary of the Great Return March, in solidarity with the ongoing protests, and there are concrete actions you can take to stand up for the rights of Palestinians. Help us to spread the word about why Palestinians are protesting in the first place, and apply pressure on the UK government to end its complicity in Israel’s ongoing repression and war crimes. Students across the country are marking the UN International Day of Solidarity with the Palestinian People, writes Huda Ammori. Ahmad Al-Bazz documents the steady demolition of Palestine's once-iconic cinemas and picturehouses. Does Israel have a ‘right to self-defence’ against Gaza? Israel claims to be acting in self-defence when its army shoots down Gazan protesters. Norman G. Finkelstein and Jamie Stern-Weiner debunk that myth. The move is a stamp of approval for Israel’s brutal occupation, writes Asad Rehman.